There is currently a commercial playing for a restaurant serving a new dish, Cinnamon Swirl Brioche French Toast. I don’t want to say the name of the establishment for fear of getting “words” from their legal department, but if I was playing charades the clue would be kangaroo. It doesn’t really matter what the restaurant is or what the food is because this is about my trying to understand why people do things. It’s the topic I’m most fascinated by—how people think. And that’s one of the primo benefits of blogging–sharing my thoughts and seeing what others think. In the commercial there are three couples pictured in a pristine restaurant enjoying this new dish and commenting on it. An entire blog could be devoted to the absurdity of this sugar coated, calorie stuffed breakfast dish that is contributing to the obesity of our society and the eventual catastrophic effects on our healthcare system but the simple fact that the overwhelming majority of the population doesn’t want to take responsibility and recognition of the effects of said food item on their physical and mental health makes it both funny and sad and therefore temporarily excuses the corporate chains. Phew. Let me catch my breath. Ok, again, I’m teetering on getting too far away from my original intention. In this commercial there are three couples, a thirty-something couple consisting of a white dude and an asian woman, who look to me to represent the modern cool couple of mixed race, judging from his t-shirt he probably works in tech, and judging from her beauty, class and dress she’s corporate. But yeah, they would eat there. Then there’s the African-american couple, very clean, very nice and intelligent, and sitting next to each other, not across, obviously in love. And yes, they would eat there, on their date night, without their kids. And lastly there’s the slightly younger, can’t quite tell if they represent the hipsters or just slightly younger version of the first geek couple, but they both have glasses, a little bit unkempt hair and thrift store dress. And hell no, they would not eat there! Unless it were four am and they were either drunk and thought french toast would still be good or they thought it would be “ironic.” I don’t think that any of the couples pictured would go there, only the actors portraying them because they really don’t have the disposable income because this is the only national spot they got this year and the residuals run out quick. Plus actors are by definition terrible with their money, so it’s already been spent. I’m not dissing the place, I’ve gone there, will go there or similar again, but I want to know why they make commercials like this? Do they think those kinds of couples are going to watch and want to go? Do they think the people that really love to go there but haven’t been for a while will want to go there because now cooler, more attractive people will be there? Do they think that the American public is that dumb, and in fact, is the American public that dumb? BECAUSE RESTAURANTS LIKE THIS ARE NOT FILLED WITH HAPPY, SMILING, ATTRACTIVE AND CLEAN PEOPLE. Really, neither are expensive restaurants. And it’s not just them. It’s the friendly staff at the superstore that I’ve never seen. It’s the polite, attractive and courteous patrons at the pharmacy I’ve never seen. And my favorite, it’s the people that eat too much fast food, drink too much beer, and take too many anti-depressants with too many side effects yet they’re ecstatic, living the perfect life, and in the case of the beer ads, getting all the really hot girls. Having studied the history of magic as a performing art, I know that it’s time when the public gets too smart and the illusions have to get better. Come on folks, let’s all up our game. Let me first say I’m not a foodie. I don’t think I’d go out of my way to get something to eat someone said “was to die for.” Never experienced that phenomenon in my life except with a woman. Boom! 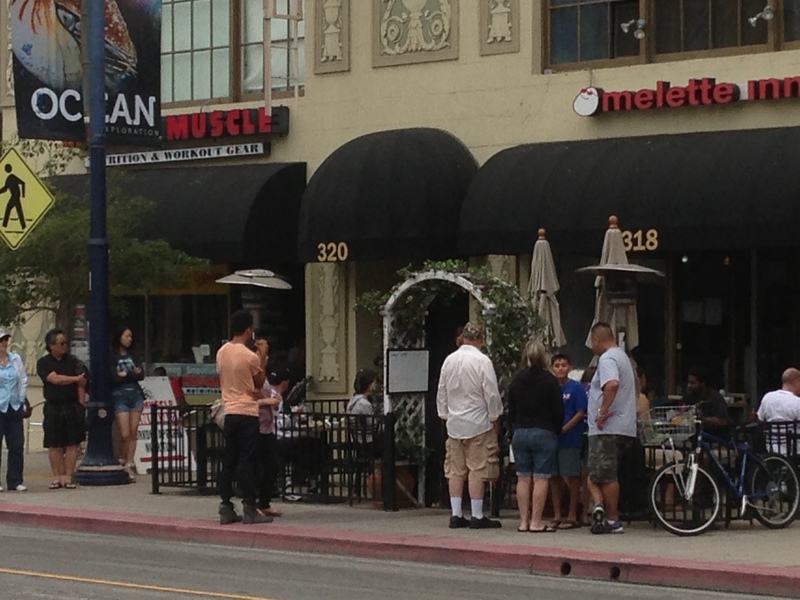 Also let me say that the restaurant pictured, The Omelette Inn*, in downtown Long Beach, is very good. I’ve eaten there a number of times. Because the act and the wait really end up diminishing the experience in my mind. For everyone involved. First there’s you and your party, because I assume that no one would ever wait alone. If they are waiting alone, they are saying “she’ll be right back” whenever someone catches their eye because it’s just so sad. I’d rather eat a bowl of dry shredded-something cereal on a small TV tray then go through that. No one ever prepares by having a piece of fruit before going to brunch and so they’re really hungry. So there’s you and your party and the fidgeting and the whiny stomach and the olfactory perception that is going to cause time to move very slowly. You’ll begin with idle chit-chat but there has never, in the history of dining, been a host or hostess that got the time right. Not her fault, she’s just trained to guess and the factors that affect the amount of wait time rival those that affect the weather forecast. Next there’s the diners. Having people watch you eat is like having a dog watch you eat. You know you’re not supposed to give him “people food” but please for the love of God would you stop looking at me and waving your tail! I tend to get really uncomfortable, like we should all speed up because there are people waiting. Lastly there’s the waitstaff. And they’ve got to have it the worst. Because the balancing act of trying to be friendly to the people you’re waiting on while mentally doing the math to determine the number of tables cleared divided by the number of people waiting divided by the number of stations has got to be staggering! Of course, I’ve waited in line, and will again. But I don’t know, breakfast? Man it’s just some version of eggs and potatoes and toast. *Omelette Inn has not paid any promotional consideration. And if I show them I put them in the blog they probably still won’t. That I’m just coming down from the sugar high incurred eating all the marshmallows in Luck Charms as a kid. Cold pizza might just be better than warm pizza. Social Security will take care of all my retirement needs. Not. That they must have drugged me as a baby and my parents didn’t know it. How else can you explain the fact that I ate marshmallow fluff? Denny’s restaurants must hatch their own eggs cause every other place has to charge three times as much for breakfast. Lee Harvey Oswald acted alone. He was just really sneaky. Wheaties originated the phrase “Breakfast of Champions” back in 1927 and it is an iconic tagline that was punctuated by its endorsements by athletes. From your blogger’s comedic perspective, I’m wondering what today’s breakfast should be called. Now there were rumors that Babe Ruth, who was a big endorser for Wheaties, had beer and rye for breakfast and was still able to perform like a champion. But if you look at the modern American diet how are we performing? Of course when we were kids, our breakfast consisted of a bowl of sugar in the shape of, let’s see: crowns (Captain Crunch), flying saucers (Quisp), and four leaf clovers (Lucky Charms); among others that charmed our palettes. It really wasn’t about the cereal, it was about the box and the character. Count Dracula and Frankenberry were way cooler than the nutrition information panel they’re now required to put on there. And man did those cereals perform! We rode our bikes, played baseball, had dirt fights, fished for crayfish in the creek, and hid and seeked…and that was before school. Maybe the reason we took naps in kindergarten was because we were all simultaneously crashing from the sugar high. Breakfast of the Couch: Where Else Did You Think You Were Going After All of That? But why am I even teasing? Eating a nutritious, healthy breakfast would mean that you had the energy to real do something, and then no excuses not to achieve your goals. A donut and a nap sounds a lot easier.